“I can not sign up as a vendor. The registration form is not visible”. 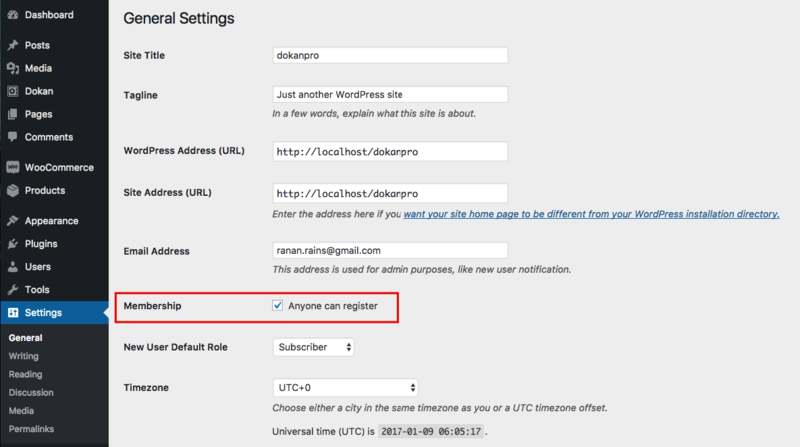 When you install WordPress for the first time, the registration form is not enabled by default. You have to enable the registration feature from the settings. Check the box which says “Membership – Anyone can register“. Dokan requires the system URL to be configured in a specific format in order to the frontend templating system to work. Navigate to WP Admin → Settings → Permalinks and select “Post Name” for common posts. Navigate to WP Admin → Settings → Permalinks → Permalink Settings → Product Permalinks. Now, select “Custom Base” for product permalinks and write “/product” on the box.